This page contains links and files that have proven to be particularly useful for myself and might be of use for those with similar interests. I’ll update this spot as I encounter more tools or pages I feel are worthy of mention. Anki: Free, open-source, multiplatform (smartphones included) flashcard application with powerful SRS1 algorithm. Especially vital for language acquisition and probably the single most important (digital) tool for efficient memorisation. Feedly: My RSS reader of choice. Free, intuitive interface, supports all the major platforms and browsers, and syncs your articles. A must have if you’re following several blogs or newspapers on a daily basis. Feel free to add me on your feed. Rikaisama: a Firefox2 extension on Rikaichan, a pop-up dictionary and a digital minded Japanese learner’s best friend. Rikaisama allows additional audio playback anki integration. I’ve written a blog on how to do this. Animelon: for all you ‘learn Japanese through Anime’ kids out there! Reminiscent of the classic Erin’s Challenge videos: watch various popular anime with japanese subtitles in kanji/kana/romaji and a script with integrated dictionary as sidebar. Perfect in combination with rikaisama as well. Tangorin: my favorite online Japanese dictionary with tons of example sentences for each definition, and an excellent Kanji dictionary as well. Goo, Weblio and Sanseido provide good alternatives. Japan-Guide Penpals: a free, extremely active penpal community and fun way to both practice your Japanese and meet new people. A lot of Japanese members on the site want to improve their English, but if you write your own ad in Japanese you’ll surely be contacted by Japanese members interested in cultural exchange, without using English. 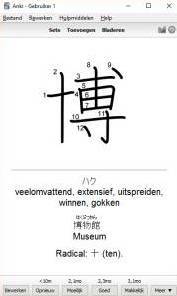 Waran Jiten: a Japanese-Dutch dictionary courtesy of Leuven University. Has a dutch rikai addon. Sourceforge: contains a wide variety of software developed by fellow Japanese learners. Some, such as Jnovelformatter, Japanese Text Analysis Tool or OCR Manga Reader are particularly noteworthy, others not so much. KULeuven Japanology: the Leuven University Japan Studies homepage. Toktogi: a Korean-English popup dictionary similar to Rikaichan/sama/kun, available both for Firefox and Chrome. It’s still a work-in-progress and not as polished as Rikai, but very usable nontheless. Naver Dictionary: Naver Corporation, the highly popular South Korean web-hub, has a fairly complete English-Korean dictionary as well as an Android application (requires internet). spokensanskrit: the only decent online Sanskrit dictionary out there. Lexilogos: multilingual web keyboard that beats learning to type devanagari on a latin-script keyboard. I use Anki to complement my other study methods for nearly all my classes. These are a bunch of ankisets I made I feel are stand-alone enough to be useful to new students of these classes as well. 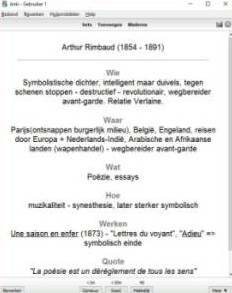 A full set to accompany the textbook ‘Literaire Verbeelding 2‘3: contains important dates and summaries of all artists and their discussed works (in Dutch), sorted by period (from Romanticism till Postmodernism). Two sets on the compulsory kanji and vocabulary as seen in the kanji classes in the first year of Japan Studies at KU Leuven. They contain stroke order, definitions, and different readings, both in recognition and reproduction form. They use the KanjiStrokeOrders4 font and display hidden hiragana on touch/hover. I recommend doing these on a handheld device to practice writing and stroke order using the touchscreen. Similar to the previous decks, two sets on the compulsory kanji and vocabulary for kanji/goi classes in the second year of Japanology, as seen in our handbook5 lessons 1 - 20. 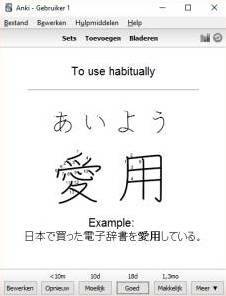 They’re tagged by chapter and contain respectively stroke order, radicals, definitions, and different readings for the Kanji set, and example sentences in cloze deletion6 for vocab, both in recognition and reproduction form. 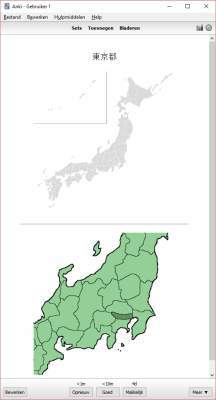 A modified Prefectures in Japan set, includes all Japanese regions and prefectures written in Kanji with furigana, and some extra maps. A full set to accompany the introductory Sanskrit language course. Includes an introduction to the Devanagari alphabet, a recap of the taught grammar points (such as different conjugations and Sandi rules), three-way cards (eng/sanskrit, sanskrit/eng and audio) of all the vocabulary as seen in class and several exercises. An Anki add-on, based on the Sanseido Definitions add-on, for adding Japanese translations of Korean vocabulary. It’s primarily meant for Korean learners who’re proficient in, or simultaneously learning, Japanese. I wrote a small tutorial for those new to Anki plug-ins. An Anki plug-in to be used in combination with a Rikaisama / Anki set-up as prescribed in this blog. Replaces or removes references to missing audio-files.